Cultural center “LatviArt” at the Honorary Consulate of the Republic of Latvia was opened in Chernihiv just several months ago and became one of the centers of cultural life of the city. Several months ago, the cultural center “LatviArt” appealed to the representatives of the Art School with a proposal to hold a joint event on the Day of Declaration of Independence of Latvia and Europe Days in Ukraine. They offered school students to show their creativity on the topic “My European future”. Under the supervision of teachers children worked enthusiastically and finally we were able to see the results of their hard work. Talented young artists presented their most creative works on their own. Elena Vyshniakova, the Honorary Consul of Latvia in Chernihiv selected works for the exhibition and decided the winner personally. A lot of pictures were devoted to Latvia-Ukraine friendship. The exhibition was visited by Nikolai Zverev, the Head of Regional Council, Sergii Moysiyenko, the Head of Culture Department, and Yurii Tkach, the Head of local cultural office. Talking to children, Nikolai Zverev said that in every work he saw patriotism and faith in the future. “Where are the children, there is light. This exhibition confirms that children feel fraternal assistance of Latvia in difficult for Ukraine times. 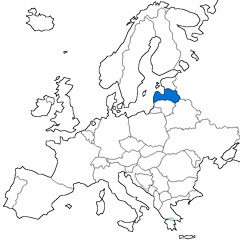 Cooperation with the Baltic country is not limited by cultural issues. There are different kinds of help. With the assistance of Elena Vyshniakova, the Honorary Consul, an agreement was achieved on the recreation of children of ATO fallen soldiers in camp in Latvia. Practical assistance to the families of the military is provided as well. I am really impressed by the works of our talented children. I believe that the future of the art is in good hands.” the Head of Regional Council stressed. Sergii Moysiyenko, the Head of Culture Department, emphasized the high artistic level of children's work and wished success to the future artists. Yurii Tkach, the Head of local cultural office added that relations between Latvia and Ukraine become closer. On-stage performance groups of Chernihiv region are going to visit the fraternal country and Ukraine will host Latvian artists. Creation of “Riga yard” is also planned in Chernihiv. It will be a place where people of Chernihiv can relax and acquaint themselves with Latvian culture. Irina Kharchenko, the Director of Cultural Center “LatviArt” congratulated children on the opening of the exhibition and on behalf of Elena Vyshniakova presented diplomas and gifts to all the participants. The winners were awarded with diplomas, art supplies and a trip for two to the Water Park. According to the director of “LatviArt”, Ms. Honorary Consul promised to support the Cultural Center in similar initiatives in the future. Thanks to Elena Vyshniakova, there is an agreement that the exhibition of children’s drawings “My European future” will be exhibit in Kyiv and will be seen by cultural elite of the country.